Members of the public are being encouraged to listen out for Corncrakes this spring and summer across East Anglia in a bid to gauge the success of a local reintroduction programme. Corncrake, which was once widespread across Britain, is now restricted to north and north-west Scotland, with recent figures suggesting that the species continues to decline, despite targeted conservation efforts. After making the 8,000-mile round trip to the Democratic Republic of Congo, where they spend the winter, Corncrakes will begin to return to Britain at the end of April and into May. It is anticipated that the Wensum Valley in Norfolk will attract a number of returning birds, thanks to a breed-and-release programme spearheaded by the Pensthorpe Conservation Trust (PCT), based at Pensthorpe Natural Park near Fakenham. Last year, 154 Corncrakes were hatched and reared by the PCT team, which included a dedicated 'Corncrake nanny' who lived on-site to help with late-night feeding. The birds were released at a location in the Wensum Valley in summer 2017 and it is hoped that 15-20 per cent of these birds will return to the area this spring, ready for the breeding season. 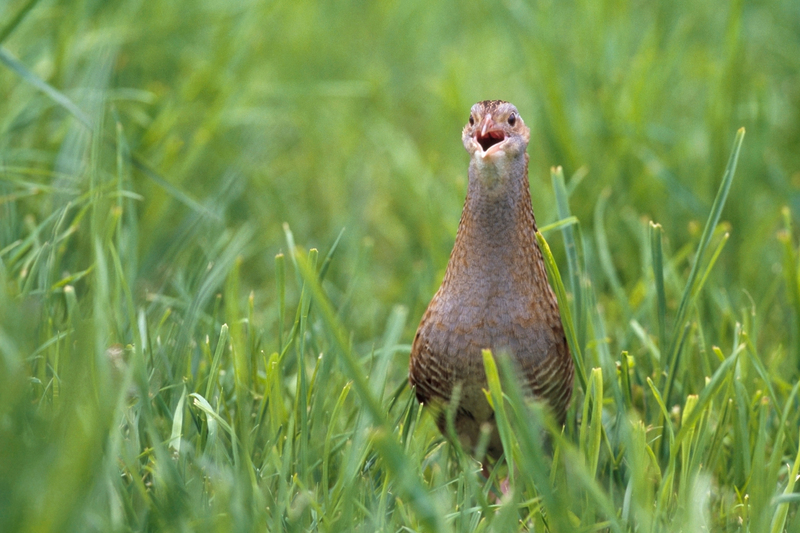 Birders are being encouraged to listen out for and record the loud 'crex-crex' call of male Corncrakes in East Anglia this spring (Andy Hay/rspb-images.com). The success of the 2017 release can only be determined by listening out for and recording the location of the unmistakable rasping crex-crex call of the males, which is characteristically loud and often made at night. By keeping a record of the numbers of detected birds, PCT can calculate how many of the birds from its programme have survived two arduous migrations and a winter in Africa. A combination of factors have affected Corncrake declines, including habitat destruction on the wintering grounds, hunting on migration routes and recent changes in agricultural schemes. Furthermore, as payments to crofters and landowners have been reduced, they now have less incentive to hold off mowing until later in the season, which has a considerable effect on the survival of recently fledged birds. Chrissie Kelley, Head of Species Management at Pensthorpe, who is running the programme, commented: "These fascinating, rare farmland birds are seriously under threat, so we are appealing for help from local birding groups and the general public to listen out for the distinct rasping cry [of Corncrake]. "We can only start to understand the success of our efforts by determining the numbers of returning birds. Of the 69 birds we released in 2016, four males were known to have returned, but we suspect numbers were higher. We hope by engaging support we will gain a clear understanding of return success." PCT has been actively involved in the breeding of captive Corncrakes for release back into the wild since 2006, working alongside project partners the Zoological Society of London, RSPB and Natural England to provide young, healthy and genetically diverse birds for the Corncrake release site at Cambridgeshire's Nene Washes. As well as supplying birds for the Nene Washes, Pensthorpe has been running its own satellite release programme since 2015. The project is being undertaken with the support of Natural England and Professor Rhys Green, a former Cambridge University Professor and Chief Advisor to the RSPB for many years on reintroduction programmes. Generally, Corncrakes prefer grassland including wet and dry meadows, and tall crops. Last year, the returning birds were heard in field margins and small areas of wildflower meadow. They also readily live at close quarters to humans. Anyone who hears the distinct 'crex crex' call is asked to email details to crex@pensthorpe.com. For more information about Pensthorpe visit pensthorpe.com or call 01328 851465.